Los Alamos National Laboratory (LANL), located near Sante Fe, New Mexico, is operated by the University of California for the National Nuclear Security Administration (NNSA, a component of the United States Department of Energy). Founded in 1942, LANL was initially staffed by a team of physicists under the direction of J. Robert Oppenheimer to work on the development of an atomic bomb as part of the Manhattan Project. LANL is now a major research facility with approximately 50 operational laboratories. LANL also hosts supercomputing facilities that support both on-site and off-site research programs. Research at LANL brings scientists from a variety of disciplines to work on military and non-military related projects. LANL scientists have developed a number of technologies related to national security interests. Research at LANL has broadened from its initial emphasis on physics and engineering into biotechnology related projects. LANL scientists participated in the development of the human genome map. Research programs also develop and improve an array of detection devices—including bio-detectors—that are used by intelligence and law enforcement agencies to detect the presence of nuclear, biological, or chemical weapons, or weapons related materials. LANL engineers develop and provide handheld radiation and isotope identifiers. LANL also provides other agencies technical advice and training in detector use. 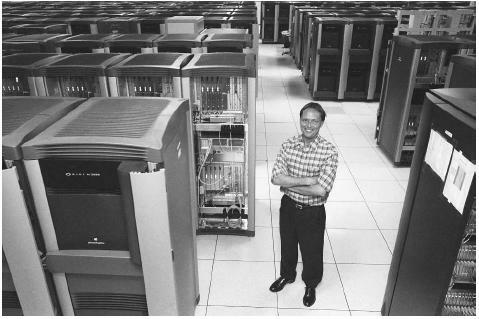 A program director of the nuclear weapons computing department at Los Alamos National Laboratory stands among the many components of a supercomputer called Blue Mountain at the lab in Los Alamos, New Mexico. are designed to provide rapid response to accidents or terrorist use of radiological materials. NEST teams would be a critical part of first response operations in the event of a "dirty bomb" attack (i.e., and attack using a non-nuclear explosion to disperse radioactive materials). Nuclear detection technologies developed as a part of NNSA's Materials Protection, Control and Accounting (MPC&A) program are used by International Atomic Energy Agency (IAEA) inspectors and some foreign countries (e.g., the Russian Federation) to enhance security of nuclear materials and to deter the unintentional transfer of nuclear materials and nuclear technology to terrorists or nations seeking to develop nuclear weapons. Bio-detector technologies include the Biological Aerosol Sentry and Information System (BASIS), designed to warn of airborne biological weapons attacks; Swept Frequency Acoustic Interferometer (SFAI) technologies allow detection of chemicals that may be components of chemical weapons. BASIS detectors were used at the 2002 Winter Olympics in Utah. SFAI detectors, termed "standoff acoustic identification" detectors provide inspection teams with remote sensing capabilities that enhance safe inspection of packages because traces of chemical elements can often be detected without unsealing containers or opening packages. LANL's powerful supercomputers allow epidemiologists and biohazard specialists to develop detailed modeling programs to forecast dispersal patterns of airborne toxins. Not all research programs have direct security applications; some hold the potential for broad engineering applications in industry. For example, LANL scientists have developed tape capable of conducting electricity with very low resistance, and computer specialists have developed software capable of improving regulation of engine ignition systems to promote greater fuel efficiency. LANL personnel often work in conjunction with industry contractors in industrial partnership programs. Other LANL programs support medical research; for example, laboratory teams have assembled a vast virus database that is used around the world to facilitate research into a potential AIDS vaccine. As one of three NNSA national laboratories, LANL scientists have contributed to a number of research projects designed to supported arms control and counterterrorism technologies. Following the September 11, 2001, terrorist attacks on the United States, LANL's Center for Homeland Security assumed the role of coordinating work on homeland security and counterterrorism technologies. In conjunction with Sandia National Laboratory scientists, LANL engineers developed the National Infrastructure Simulation and Analysis Center (NISAC) that allows officials to create and test response strategies. Threat analysis and warning technologies provide intelligence and law enforcement agencies enhanced capabilities to deter smuggling and other terrorist-related activities. LANL research programs are also attempting to improve INS (Immigration & Naturalization Service) regulation of border activity by improving automated entry/exit systems. One such program—GENetic Imagery Exploitation (GENIE)—is designed to improve biometric and feature-extraction analysis. Los Alamos National Laboratory. < http://www.lanl.gov/worldview/ > (March 23, 2003). University of California. Department of Energy National Laboratories. < http://www.universityofcalifornia.edu/labs/ > (March 22, 2003).